ASME > Don’t Stop the Music-ABC Television Documentary. All the links you need to support this amazing series. Don’t Stop the Music – Let’s keep the momentum going and bring music into all schools! After the stunning success of this TV Documentary, there are now many resources and links for you to support and use excerpts from the show to highlight the importance of music in your community and also for educators to share widely. A great article about the impact of music on student learning and reading here from the Guardian. ASME’s Immediate Past-President, Dr Brad Merrick was privileged to have had the opportunity to support Artemis Productions and their inspiring Producer, Celia Tait with the ongoing development of this powerful three-episode series. The series tells the story of the development of a music program at Challis Primary, a disadvantaged school in Western Australia. This story highlighted the power of music in the learning process for the community, staff, students, and parents involved. It is a wonderful journey for all involved. Please visit the homepage at the ABC Don’t Stop the Music website. We are excited to be supporting this venture and hope you will contribute to the collection of instruments that will be part of the follow-up and advocacy associated with this story. 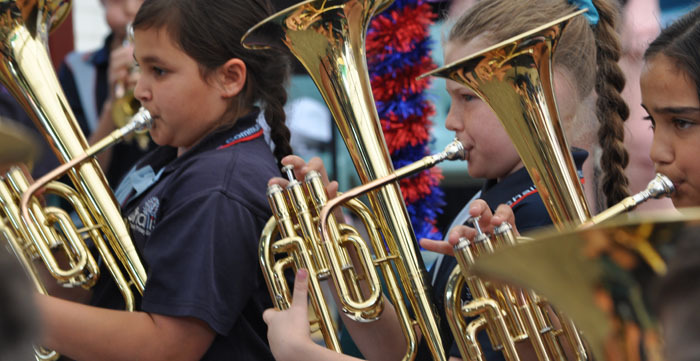 The Salvo Stores Australia and MusicaViva have been incredible in the way they have organised the collection of these instruments and for distribution to schools that need assistance with their music programs. Many musicians, educators, and students have been assisting in the checking and preparation of the well over 4000 instruments that have been donated Australia wide. ASME is proud to support this series in any way possible, through sharing the resources and experiences that were part of this amazing series that featured Guy Sebastian and esteemed researcher and music educator, Dr. Anita Collins (a Keynote presenter at the ASME National Conference later in the year). Micheál McCarthy, Senior Lecturer in Music at the Western Australian Academy of Performing Arts also worked as a mentor to the Challis generalist music teacher throughout the show, playing a significant role as the Classroom Music and Choir Mentor as the music came to Challis. It was a wonderful story of that reinforces the Power of Music for all involved, including the students, teachers, conductors, mentors, and the broader community. We hope that this show inspired everyone to find that old instrument and donate, or to get their instrument out and play again! Please keep the momentum, moving forward.